An Egyptian American poet who lives in Alexandria, Egypt. I Wash in the Light of Your Eyes, 2011. 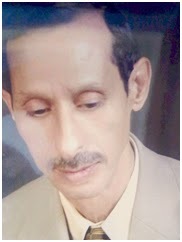 Mohamed N Elramady's poems have been translated to Italian, English, Turkish, French, Indonesian, German, Farsi, Neplai and Hindi and I have read them in Egypt and in Lebanon. Some of my poems were published in California State Poetry Society, and in the life and legends magazine. Poem "The Funeral of Life" was selected for the anthology of modern poetry, "Necklaces of Arab Poetry". Poem "I was not but fair with you" was published in Watan magazine, Bahrain, September 22nd, 2010 issue. The poem titled "Shock and Love" was selected for publication in Basryatha, Iraq. He has written many other poems published in online forums. He is a member of the Lebanese Organization of Permanent Cultural Dialogue, whose mission it is to spread the culture of dialogue and tolerance.